Seeing the “Jondrette” family in utter poverty is sad. He’s not lying about the kids not having eaten. They don’t even have a full set of clothes for everyone. And Thénardier mistreats them all, making things worse to elicit more sympathy. It’s stomach-churning. The parents may be terrible people, but Éponine and Azelma don’t deserve it. You can see why Gavroche left. He and the younger brothers are better off on the streets. On February 2*, Éponine and Azelma bump into Marius and drop a packet of letters they’re carrying. He picks them up, but they’re long gone. So he decides to look at them for a clue to return them. They’re Thénardier’s scam letters to prospective marks. All different identities, all different stories, all different schemes…but also all badly spelled. I’m not sure the letter promising to dedicate theatrical verse to the prospective markpatron is likely to succeed. Then again, terrible grammar and spelling are endemic in modern scam emails too, and they still catch people. I’m not sure why Marius finds it odd that the same person wrote letters “from” four different people. We’ve already seen that letter-writing is a professional service. Though perhaps the professional scribes tend toward better spelling? One of the letters is actually addressed to Valjean (though only by description). It’s the one with the fewest lies (that and the one he later sends to Marius, their next-door neighbor), because he’s invited him to come see the sorry state in which they live, hoping for direct charity rather than pushing a more elaborate scam. Anything complex would be caught. The first clue that the old man is Valjean: he’s surprised when Éponine tells him their address. It would be too much coincidence even for this book for them to live in the same apartment, though. Valjean lived at the top of the stairs, the Jondrettes at the end of the hall. *I was surprised to see the groundhog day tradition cited, even by another name, since I thought it was an American oddity. Apparently groundhog day grew out of an older German Candlemas tradition which states that if a bear sees sunlight on February 2, it will return to its den to prepare for six more weeks of winter. The Candlemas tradition is brought up here. This entry was posted in Book Commentary and tagged Azelma, Eponine, Gorbeau Tenement, Jondrette, Poverty, Thenardiers on April 17, 2018 by Kelson Vibber. 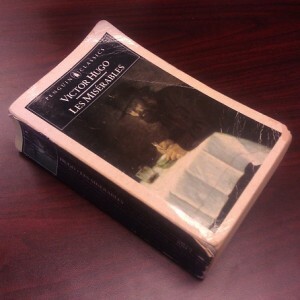 I’m re-reading Victor Hugo’s Les Misérables after 20 years. Start with part 1, go back to Valjean’s second prison sentence, or read on. Getting Cosette away from the Thénardiers takes 45 pages. The other day I was flipping through The Complete Book of Les Misérables and noted a comment from one of the show’s writers that the book wasn’t really that complex. I scoffed, but you know, they’re right. It isn’t complex. It’s just ridiculously detailed. We learn a bit more about the Thénardier family. 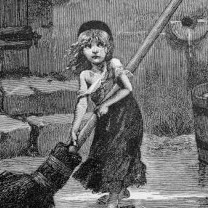 In addition to Éponine and Azelma, whom Mme Thénardier dotes on, there’s an infant son she neglects. (IIRC he later turns out to be Gavroche, though I’m not sure the timeline fits. Update: yes, it’s him.) Mme Thénardier “talked like a gendarme, drank like a coachman, and treated Cosette like a gaoler.” Her husband’s business philosophy in “Master of the House” is practically lifted from this chapter — they just made it rhyme. Strangely, despite all this detail, Hugo hasn’t mentioned either adult Thénardier’s first name. They really aren’t comic relief in the book. They’re sleazy, they’re odious and disgusting, and while there are comedic and ironic elements to them, they inspire more revulsion than laughter. If Javert is the noble villain, they’re the base ones. Fetching water from the well is a BIG DEAL, especially at night with no lights (remember the last time you went out in the woods at night far from well-lit streets? Imagine that without a flashlight), especially for a little girl who’s been brought up to fear everything…and pointed to a bucket larger than she is. She can barely move it empty. This is not the way Cosette wanted to spend Christmas Day. Oh look, another mysterious stranger who will eventually be revealed as Jean Valjean. This is getting to be a pattern. “The stranger” is in the woods to check on where he buried his savings, then to head into town to look for the inn. He helps this poor little girl, then asks her name. Cosette’s tale of her home life is…not what he had been led to expect. Valjean in the book is very deliberate. He rarely takes a big action without looking at the situation and thinking it through. 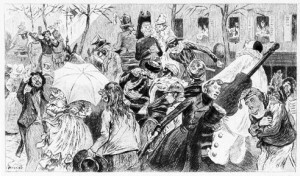 He spends an hour at the inn observing how the Thénardiers treat Cosette vs. their own children, intervening on her behalf several times. But when there’s an immediate threat to someone, he reacts instinctively: the cart, the mast, or Madame Thénardier threatening to beat Cosette. Cosette gets in trouble for playing with Éponine’s discarded doll. (Yes, discarded. Éponine and Azelma have tossed it aside to dress the kitten.) Valjean solves the problem by buying her the fancy doll she’s been staring at all day when she could get outside. Cosette sleeps in a cupboard under the stairs. Beauxbatons would have been around at the time according to Harry Potter canon. But I suspect Thénardier would cook and serve the owls. Hugo twice mentions little Cosette’s habit of sticking her tongue out, and is very apologetic about having to mention it both times. At least he doesn’t take two pages like he did to justify swearing during Waterloo. Thénardier goes after them as they leave town, demanding a signed note from Fantine. Oh, you mean like this one? He’s disappointed to actually get it. He was hoping to be bribed. 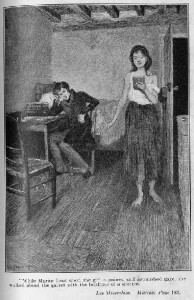 After 30 pages calling him “the stranger,” Hugo admits that “the man in the yellow coat,” is Jean Valjean. In other news, the extended movie soundtrack is out today. Strangely enough, I’m not sure I want to pick it up. While I liked the movie overall, I still haven’t listened to the highlights album. It just seems like something would be missing to try to separate the sound and visuals from each other in this version. Pages covered: 338-384. Continue on to the chase through Paris. This entry was posted in Book Commentary and tagged Azelma, Cosette, Eponine, Jean Valjean, Montfermeil, Parenting, Thenardiers on March 19, 2013 by Kelson Vibber.